Set in London of the 1660s and the early twenty-first century, The Weight of Ink is the interwoven tale of two women of remarkable intellect: Ester Velasquez, an emigrant from Amsterdam who is permitted to scribe for a blind rabbi, just before the plague hits the city; and Helen Watt, an ailing historian with a love of Jewish history. The Weight of Ink is the winner of a National Jewish Book Award and a USA Today bestseller. "A gifted writer, astonishingly adept at nuance, narration and the politics of passion." "I gasped out loud…[Kadish has a] mastery of language…[The Weight of Ink] was so powerful and visceral…Incredible…I haven't been able to read a book since." 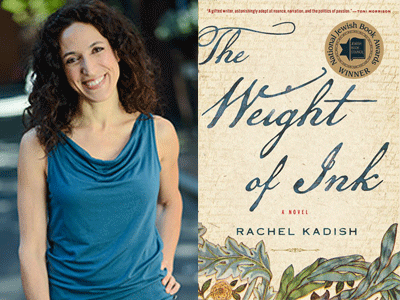 Rachel Kadish is the author of the novels The Weight of Ink, From a Sealed Room and Tolstoy Lied: a Love Story, as well as the novella I Was Here. Her short fiction has been read on National Public Radio and appeared in the Pushcart Prize Anthology, and her essays have appeared in The New York Times, Salon and Tin House. She has been the Koret Writer-in-Residence at Stanford University and a fellow of the National Endowment for the Arts, and has won the National Jewish Book Award, the Association of Jewish Libraries' Fiction Award, and the John Gardner Fiction Award. She lives outside Boston and teaches in Lesley University's MFA Program in Creative Writing. Click here to buy your ticket to the event! Books will be available for sale at the event for $28 plus tax (hardcover) and $17 plus tax (paperback). Books sales provided by Books Inc. Palo Alto.